First, I'd like to talk about PowerShell Core which is a module that can run on different platforms. Yes, It is a cross-platform version of PowerShell that is based on .NET Core, and this is an open source application. (Note that the “traditional”, built-in version of PowerShell is NOT open source and it is based on .NET Framework). But in this post, we'll take a plunge and install VMware Management Framework, which is very popular within VMware admins, and which is called PowerCLI. The PowerShell Core is freely downloadable from Github and can run different platforms: Windows, Linux, and Mac OS. Microsoft will continue to release bug fixes for PowerShell on Windows but there will be no more new features introduced. In short, PowerShell Core is the future and is embraced by Microsoft. And for VMware admins like you or me, this allows you to manage VMware vSphere environments from Linux or Mac OS with PowerCLI. 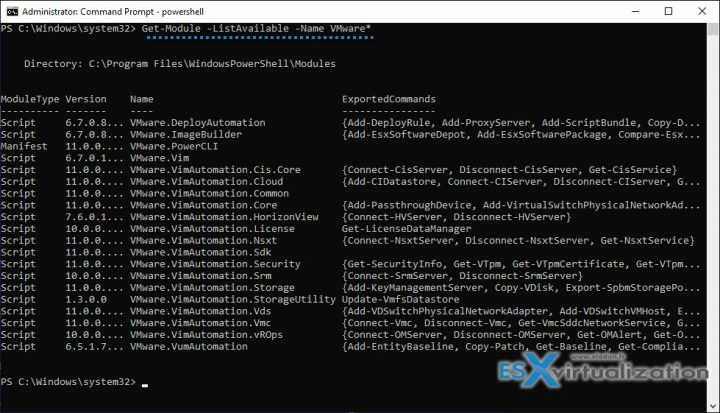 But let's get back to our small tutorial where we want to teach you How To Install VMware PowerCLI via PowerShell. First, check the version of PowerShell you're running. You can be on Windows Server 2012 R2, 2016 or Windows 8, 10…. so checking and installing the latest version of PowerShell BEFORE installing VMware PowerCLI is perhaps the best way of doing it. Hint: You can copy this directory with all the modules to a USB key and use it for installation onto a system whcih does not have an internet connectivity. Yes for “Offline” systems. You'll get a prompt to install NuGet-provider. Click Y to do so. This will install the NuGet-provider which is necessary. You can also check which modules are installed..
And you'll get a list. Well, this is it. 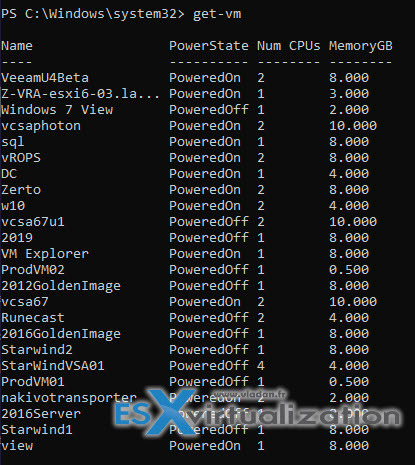 We have installed VMware PowerCLI from within PowerShell. I'm not a scripting guy. The scripting guys might find it perhaps to easy, but for someone just starting with VMware technology or for someone who isn't scripting guy like me, this tutorial might be handy. At least I hope so…. If you're new to VMware you may want to start with some simple tutorials, right? Where to find the cheapest version of VMware vSphere? Essentials Plus which has vSphere High Availability, is an obviously better choice. Because, if you have an unplanned hardware failure, vSphere HA can restart automatically those VMs which failed with the host. Those VMs are automatically restarted on other hosts which are part of VMware cluster. There is small downtime during which the system figures out which host has failed and which are the hosts that are able to start the failed VMs. Once this automatic decision is taken, the VM boots up. The whole process is completely automatic and acts without the admin’s intervention.